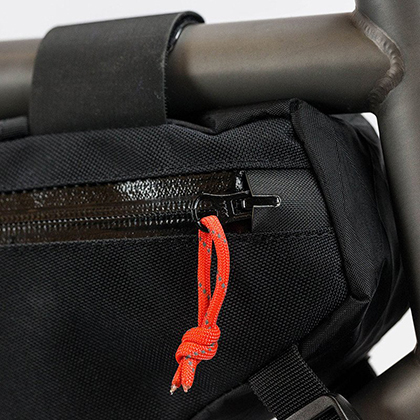 The #carryeverything Restrap Frame Bag features rubberised strapping to provide greater grip to the frame whilst not affecting the frames finish. The use of reflective paracord zip pulls give additional security whilst the inner mesh pockets with an additional document pocket keep items safe when on the move. The Restrap Frame Bag is made from a 1000D military-grade Cordura outer and VX21 fabrics with fully waterproof zips to keep the contents safe and dry in the worst weathers. If you want a frame bag to #carryeverything the Restrap Frame Bag is the perfect choice for you.